Sim Lim Episode Follow-Up | I'm skin deep. because I kiss the society's standards. 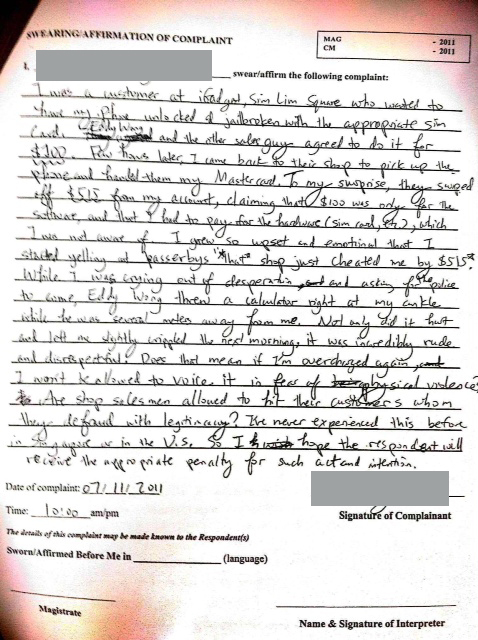 Posted on July 13, 2011, in Complaint, Singapore and tagged crime registry, criminal offence, eddy wong, edward lim, electronics shop, iGadget, iPhone, judge, magistrate's complaint, Sim Lim, Sim Lim Square, singapore, subordinate court. Bookmark the permalink. 11 Comments. I would suggest learning the dialect of choice of most singaporeans just so they don’t think you’re a foreigner. im disgusted and ashamed of what our fellow singaporeans did to you. I feel for you. Never go Sim Lim if you have no knowledge of the stuff you are buying forums.hardwarezone.com.sg is where u can seek knowledge. I was reading your entry and i was hoping the 2 guys will be sued. But too bad, this isnt the case. In chinese there is a saying, what u do the sky is watching! Good to know that website! Yes I hope one day they will discover their conscience. When I moved here from Boston, I had to unlock my iPhone. I was new to the unlocking concept and was looking for shops in Singapore who can do this. And I found a shop in Sim Lim Square. They charged me $50 for the jailbreak & unlock. Reading your story, I am appalled by the behaviour of the shop employees. Though I ain’t a Singaporean, I feel sorry that a fellow human being had to go through so much for a simple sim card problem. But your experience, though not good, is an eye opener and lesson for other expats who come to this charming country. Hence without seeking your permission, I just tweeted both of your blogs on my page. Hope you don’t mind. You were lucky that you found the right shop among all the shady shops at Sim Lim! Thanks for spreading the word to all other expats because I wasn’t the only victim, as cheating at Sim Lim is quite rampant and something that the police close an eye at. Everyone knows that Sim Lim has this reputation yet no one’s doing anything about it. It’s very confounding to me. First of all – good on you for making a fuss. Most people just walk away and accept defeat. I am conflict-averse myself as well but acknowledge that sometimes you have to do something for things to change. I used to be Singaporean, but have since migrated away and taken up citizenship in another (couple of) countries. So I look like a Singaporean, and when I’m elsewhere in Asia, I can make people believe that I speak like a Singaporean. But as you’ve established, the kind of dishonesty that happens at Sim Lim is not restricted to foreigners. And ultimately, these dodgy operators have seen enough people come through to know that I’m not a local (even though it might take a short conversation to establish that). I do shop at Sim Lim, and have done so quite often. I get a bad taste in my mouth everytime I go there, but I know what I’m looking for and I know what prices should be. It doesn’t make the experience there any more pleasant however. I continue to shop there only because sometimes (at the higher floors) it still is the only place to get the cheapest prices. In an ideal world, your incident would be recorded on camera, and then posted on YouTube (and that footage would have been sufficient evidence in court). I would love for something like this to get viral on the Internet – not because it will benefit me necessarily, but I think if more and more instances of recordings were made by people, then it may just be the kind of thing to make these operators think twice before they attempt their intimidation and dishonest practices. The embarassment is probably not the deterrent – it’s the fact that with video evidence, it becomes slightly more likely that they can be found guilty of a criminal act (and WITH evidence, finally the draconian Singaporean laws can finally be of some benefit!). So I do encourage those who are going to Sim Lim next time to bring along one of those hidden cameras – the most common ones being those USB ones that are hidden in a pen (which ironically Sim Lim is probably the place to find them). In fact, I’m considering organising a sting and setting these guys up for the fall. So if any of these operators happen to be reading this – pray you don’t get me walking into the store, and if I do, you better be nice to me. I do think however that it’s probably the usual case of a small percentage of dodgy operators that spoil the reputation for the others. I personally can point to a handful of people I’ve dealt with who have been nothing but professional and helpful. Finally, on the point of the law, if you do have evidence, remember that it’s not only a criminal matter (in the case of personal assault). You are still entitled to sue them for personal injury. 90% of the time, this never works out to be cost efficient as it’ll be more trouble or expensive than it’s worth in the court system. But sometimes it’s the principle that counts, and it will really show these guys that not everybody is just going to accept it and walk away. It’s not my first time to go to see this website, i am visiting this site dailly and get good information from here every day. Victims of SIM LIM Square ,Lets get together and push the police, the government, CASE , management of the shopping mall to take action! Lets teach these buggers a lesson not to cheat on innocent people.